Boomerang shaped cottages. Two bedrooms. Ocean & forest views. The Boomerangs are award winning architecturally designed, boomerang shaped cottages for those people who are looking for something completely different. The Boomerangs on the Great Ocean Road offer guests luxury accommodation in an absolutely beautiful and pristine environment. Spas, log fires, wide screen, digital televisions with a comprehensive DVD library, spectacular ocean views and fantastic landscaped gardens. Quintessentially Australian. Our cottages have two bedrooms both with queen size beds. A single trundle bed is available for a fifth person. Our bathroom has a spa bath & separate shower. The Boomerangs are situated on the Great Ocean Road at Johanna in Victoria's Otway Ranges with valley, forest & ocean views. They are surrounded by the Great Otway National Park & central to all local attractions. The Boomerangs are perfectly situated for those doing the Great Ocean Walk. Conveniently located but very private. The Otways is full of amazing rainforest walks and waterfalls - all just a short drive away. Deserted beaches abound - Johanna beach just a few minutes. The famous 12 Apostles is a 45 minute drive and the Otway Fly - the worlds longest and tallest rainforest canopy walk - is just 25 minutes drive. Cape Otway Lighthouse is also just a short drive away. Midway on the Great Ocean Walk! We built the Boomerangs in 1997. We wanted to offer something unique to visitors. The idea of the Boomerang shape came from our builder who suggested we use a curved shape to take in the panoramic views. Our cottages are surrounded by 3 acres of landscaped gardens which attract native birds. The high windows allow for 180 degree day and night views, the stars in this part of the world are beautiful. We love living in the Otways. We are able to go bush walking in the beautiful countryside that surrounds us. We also like to Kayak along the Aire River and in the ocean on calmer days. Mark is a surfer who can cope with the wild waves at Johanna beach. Roz practices yoga to unwind. We both love taking Hanna for walks along Johanna Beach in all seasons. 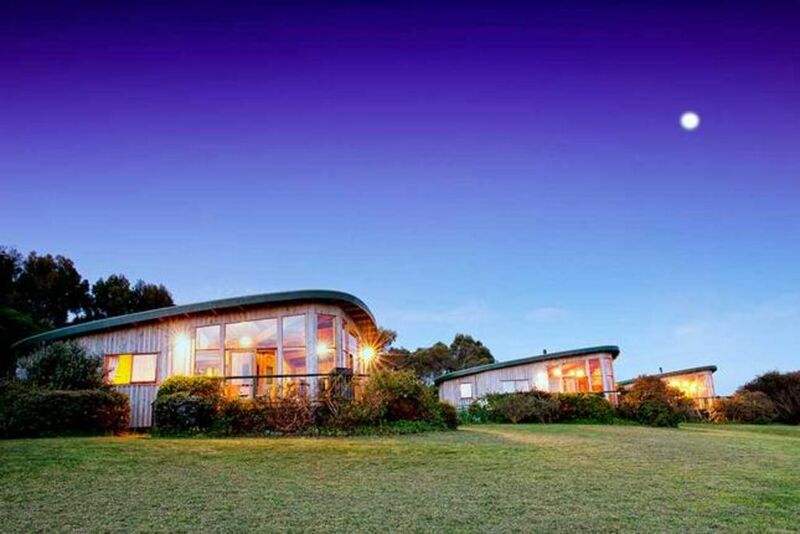 Its the only place in Australia where you can stay in a Boomerang shaped Cottage! The 3.3m high windows allow for a panoramic view of the Johanna valley , Ocean and Otway forest. Johanna Beach is a fantastic surf beach that is also popular for fishing. The swell can be huge depending on the weather and you can often hear the ocean roar from our cottages. Johanna beach is midway along the Great Ocean Walk. You can walk parts of the Great Ocean walk and see local kangaroos in the Johanna Valley. Visit the waterfalls inland from our property around Beech Forest- Beauchamp Falls, Triplet falls and Hopetoun Falls. If you can fit in a visit to the Californian redwoods they are well worth it. the Otway Fly trreetop walk is also located near Beech Forest- a 20 minute drive from The Boomerangs. Cape Otway Lighthouse is a dramatic location and the area around the lighthouse shows the history of the area. The 12 Apostles are about a 45 minute drive located in Port Campbell national Park. Whilst there also visit Gibson steps and loch ard gorge as well as London Bridge and the Grotto beyond port Campbell. Take in the foodies loop via Timboon for strawberries (in season) locally made chocolate & cheese, ice cream & mico brewery. Melba Gully is only a 10 minute drive to see the Glow worms. Its a lovely short walk in a temperate rainforest setting. Or simply chill out and relax wandering around our garden.